No Four in a Row is played on a grid of irregular shape. 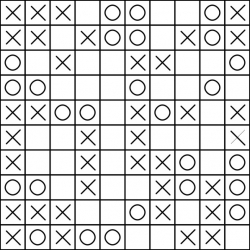 Some cells of the grid contain 'X' and 'O'. The task is to fill in the grid so that four consecutive identical symbols never appear in any row, column or diagonal.